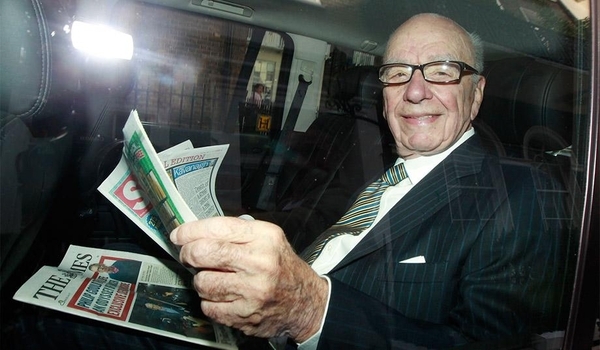 Rupert Murdoch has been a controversial figure in the media of Australia, then the Western world, and more recently the whole world, for a total of nearly 65 years. He inherited control of his father's newspaper group at the age of 21, in 1952, and had built it up very substantially by the time he moved to Britain in the late Sixties. He became prominent in the United Kingdom with his acquisition of the News of the World and the Sun, in London, soon that country's largest-circulation newspapers, and became active in the United States about ten years later. He created the modern tabloid newspaper, smashed the tyranny of the shop stewards and despotic print unions in Britain (making that industry much more profitable), and has been a pioneer in satellite television and vertical integration joining film studios, television networks, and cable and satellite delivery systems that at one time operated almost everywhere in the world. Mr. Murdoch's accomplishments as a media owner and pioneer have been celebrated for decades and they are not the subject of this column. Nor are the many controversies in which he has been a protagonist, some of which have revealed him as unsavory, destructive, and occasionally ludicrous. As a one-time competitor, in Britain and Australia, I held my corner well enough but had some grievances with Murdoch that have nothing to do with competition and do not fade quickly, but are not germane here. His tabloid talents and cynicism about the public and about public office-holders have been notorious for a long time, and are well captured in the animated comedy The Simpsons, where the people are crude, the public is stupid, and the public officials are crooks. Most of Murdoch's tastes are down market, as the sorry descent of the London Times illustrates. This portentous prologue was necessary to make the two points that motivate this column. Rupert Murdoch, in his seventies and eighties, has rendered two immense services to America and the world, and they seem to have gone quite unrecognized, at least publicly. In the Wall Street Journal, he took over a well-respected newspaper, yet one that was an incomplete newspaper, as it had no sports or features or pictures, and had an inspired highbrow-conservative comment section but a rather left-liberal business-oriented news section. He actually strengthened the comment section, by adding a little variety and making the editorials slightly sharper, and vastly improved the news section, almost eradicating the snide leftish tenor of some business stories. He imposed an ultra-professional separation between opinion and reporting, and added much-improved foreign news, color photographs, imaginative features, slick magazine inserts, sports, and style — and made the WSJ incomparably the highest-quality newspaper in the world. Of course, Paul Gigot and the editorial board and a large team deserve credit. But there is no doubt that the impulse to improve the Journal, broaden it, and give it depth and panache must have come from Rupert Murdoch, who must have the most profound and varied experience of any newspaper owner in world history. If he had taken the Journal down market, for which there is precedent in his company, and as many feared, including the people who sold it to him, he would wear that opprobrium. The credit is his that in his hands a fine newspaper has become superb, perhaps unprecedentedly so, even as the newspaper industry wallows in perilous times. For doing this, Rupert Murdoch deserves much admiration, not that there is ever any indication that he seeks it, but I'm not aware that he has received any. The Journal's reporting is always reliable and insightful, thorough, factual, and competently, often elegantly, written. Comment and editorial are an oasis of percolating originality, thoughtful and never quackish, and the tenor of the pages is fearless, sensible, and an unanswerable antidote to the partisan and ideological hysteria of almost every other large media outlet in the United States unaffiliated to News Corporation (Murdoch's company). With this, I sidle up to the other great munificence Rupert Murdoch has conferred in recent years: The Wall Street Journal, Fox News, and to some extent the New York Post (also owned by News Corp.) are almost all that has prevented the Never Trump media zealots from leaving Candidate and President Trump with no conventional media support, and reliant entirely on his love of social media and his powerful allies in the talk-radio industry. Such a state of affairs would have pitted the half of America who tenaciously follow, admire, and believe in the president with no politically compatible television and daily print media to satisfy them. Though the other networks and principal newspapers are unlikely to thank Murdoch for it, he is all that stands between them and an overwhelming deluge of public hatred and incredulity. If Nicholas Kristof (New York Times), professing to detect "a whiff of treason" in the nonexistent Russian collusion with the Trump campaign, and Wolf Blitzer (CNN), announcing that Donald Trump coordinated a group of prostitutes to urinate in a Moscow hotel bed because the Obamas had once slept there, and Michael Kinsley (Slate) pronouncing Trump a fascist, and Mika Brzezinski's Trump-induced mental breakdown and Rachel Maddow's nonsense with Trump's purloined tax return on MSNBC, and all the others, made a solid wall of defamatory hatred of the president, popular anger and the discordance of public discourse would be much worse than they are. We get fairly frequent, and generally silly, demonstrations against Trump, but if there were no access to fairness in the national media for the administration, there would be counterdemonstrations and a good deal of violence. Ultimately, the national media would be completely debunked, and the implications of such a state of affairs would be extremely serious. Trump attacked the entire political class, all factions of both parties, the Bushes as vigorously as the Clintons and Obamas; Wall Street as much as Hollywood and most of academia. At his heavily attended campaign rallies all around the country, he regularly called attention to the reporters and pulled a lusty torrent of brickbats down on them. If what the national media had provided the winning candidate had been an unbroken wall of libel, slander, and fabricated misinformation (which is practically what it is without Fox and the WSJ), the revulsion against the free press and the level of division in the country, unnervingly high now, would be extremely dangerous. Rupert Murdoch has earned a reputation as an astute judge of political horseflesh. He backed Margaret Thatcher, Ronald Reagan, and Tony Blair early, and declined to join the Hillary or Obama bandwagons. With Trump, he kept the door open and is identified with him only because he declined to join the Never Trumpers. Murdoch was the most successful media owner in world history before he took over the Wall Street Journal and before there was much thought of Donald Trump as a politician. In making of the Journal the world's best and most reliable newspaper and in maintaining, throughout his outlets, a fair perspective on the Trump phenomenon, he has earned the gratitude of all the media and of the whole country. He has also made wise decisions, commercially and otherwise. More important, he has crowned his astonishing career and still active life with genuine greatness. As an old, and once cordial, adversary, I salute him.